Condition of the 13 cards range from NRMT-MT to MINT. The cards you see in the scan are the cards you will receive. This item is for a 5 card lot of 1990-91 Score Canadian Rookie cards of Dallas Stars, Mike Modano. This lot is all Raw Graded by Beckett as 8.5. FREE Trial! Lot of 10 - 1990 Bowman Mike Modano Rookie Card RC #188! 1990 Bowman Mike Modano RC #188 (Each card will be loaded in a top loader). LOT OF 10! Good luck! 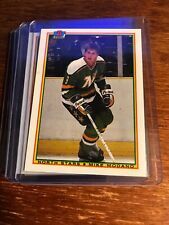 1990-91 Pro Set North Stars Hockey Card #142 Mike Modano RC 18 Card Lot. Shipped with USPS First Class Package. Lot of 3 - Rare 1990/91 Topps Mike Modano ROOKIE ERROR CARDS-Dallas Stars HOF! You will receive 3 of these cards! Nrmt or better! A lot of 12 different Mike Modano cards with 30 cards in total. Score #120 - x6 - ROOKIE. Bowman #188 - x1 - ROOKIE. Upper Deck #346 - x3. Upper Deck #32 - x1. The cards are the following Pro Set #105 - x1. YOU WILL GET ALL THE CARDS SHOWN FOR A TOTAL OF 10 OF HIS CARDS. 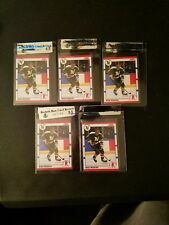 1990-91 UPPER DECK HOCKEY ALL ROOKIE TEAM ROOKIE RC CARD # 346 X 3 CARDS. 1990-91 UPPER DECK HOCKEY ROOKIE RC CARD # 46 X 5 CARDS. 1991-92 UPPER DECK HOCKEY CANADA CUP CARD # 32 X 2 CARDS. Mike Modano: 1990 Upper Deck #46 & 346 Rookie RC ~ North Stars NM Lot. Condition is Like New. Shipped with USPS First Class Package. MIKE MODANO 3 CARD LOT WITH 90-91 UD ROOKIE. NICE LOOKING LOT. CARDS ARE IN MINT-NR.MINT CONDITION. TAKE A LOOK AND JUDGE YOURSELF. BIDDING STARTS @$1.50. SHIPPING IS $4.99. I COMBINE SHIPPING. $1.00 FOR EACH ADDTIONAL AUCTION WON. ANY QUESTIONS,PLEASE ASK. THANKS!! The buy it now price is for 1 card, buy as many as you want up to the quantity available. You are purchasing a Mike Modano hockey card collection. This collection consists of 1000 Mike Modano hockey cards, this is not a typo, you will receive 1000 (one thousand) Mike Modano hockey cards.